It was meant to be the fairytale send off for Steven Gerrard but Tim Sherwood had other ideas. Yesterday’s dramatic FA Cup semi final between Liverpool and Aston Villa saw Sherwood’s side upset the apple cart and book their place at Wembley. 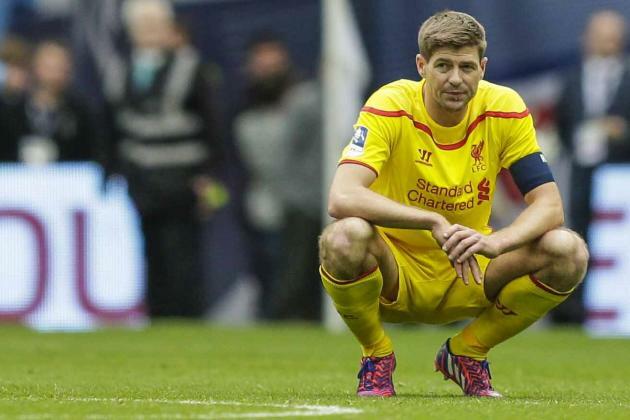 For Gerrard, who is set to leave Liverpool at the end of the season it was heartbreaking. One last chance at silverware with his beloved Liverpool cruelly snatched away. Goals from Christian Benteke and Fabien Delph were enough to cancel out Phillippe Coutinho’s early strike and send Villa to their first FA final since 2000. Liverpool did have a Mario Balotelli goal wrongly ruled offside in the 88th minute but to be fair to Villa the result was what their performance deserved. Credit must be given to Tim Sherwood who has transformed this Aston Villa side since replacing Paul Lambert as manager only 11 games ago. His first game as manager was the nail biting 2-1 last 16 victory over Leicester in the FA Cup. Although not officially in charge for the game, Sherwood did give a rousing half time talk to the team with the game evenly balanced at 0-0. His words spurred them on to victory as they did again against West Brom in the quarters so yesterdays win seemed only fitting for the effort he has applied so far. The defeat has heaped further pressure on Sherwood’s opposite number for the day, Brendan Rodgers who must be anxiously looking over his shoulder for the galloping Jurgen Klopp riding in to rescue the club. Rodgers had high hopes for this campaign after a close conclusion to last season which saw them finish second behind eventual winners Manchester City. But it has all gone terribly wrong for the Northern Irishman who has failed miserably in his attempts to replace Luis Suarez. Never an easy task, Rodgers fumbled in the transfer market like a kid in a candy store unsure what to spend his vast wealth on. A range of players arrived like Rickie Lambert, Lazar Markovic, Mario Balotelli and Adam Lallana but all have struggled to fit into Rodgers apparent system. To be fair, it is hard to adjust when the system used keeps changing, a notion that has perplexed the usually reliable Gerrard all season. Deployed as a Regista (a deep lying playmaker who sits just in front of the back four), Gerrard’s inability to remain in a withdrawn position and not venture forward was ultimately his downfall. Rodgers adapted the system to push Gerrard further forward but in doing so disrupted various other players including the highly effective Raheem Sterling who was operating in the hole behind the central striker. Gerrard’s form dipped, unsure of the role he was meant to play and was subsequently benched by Rodgers in a move that only frustrated the former England midfielder more. Their relationship has deteriorated over the past few months despite the pair denying the rumours. Gerrard it seems will leave the club under a cloud with five meaningless games left in the regular season with only Champions League qualification to play for. As for Rodgers, who became the first Liverpool manager since Phil Taylor (1956 to 1959) to go three seasons without lifting any silverware, he must wait to see how Chairman Tom Werner reacts to yet another disappointing Liverpool campaign, with Klopp waiting patiently in the wings. Villa meanwhile go on to Wembley to face current holders Arsenal, who are looking to replicate their 2001 and 2002 successes by winning back to back FA cups. Arsene Wenger’s side progressed to the final thanks in part to a horrific error by Reading goalkeeper Adam Federici who fumbled a weak effort by Alexis Sanchez in extra time, only to see it squirm into the net. The Australian stopper who had played well up until that point was inconsolable at the end of the match with teammates and Reading staff quick to offer him support. It was a painful blow to manager Steve Clarke who watched his Championship side push Arsenal all the way into extra time. Struggling in the league, Reading have relied heavily on Federici to perform miracles and in several cases keep them in games. Without him in goal, Reading would be staring down the barrel of relegation. Instead seven points clear of the bottom three with four games left, Reading should survive hence why they could comfortably focus on Saturday’s FA Cup semi final. They gave it their all but in a cruel twist of fate, it was all snatched away from them. No one can really know how that feels except for perhaps one man – Steven Gerrard who is going through the same pain today after realizing that his Wembley dream fairytale was now officially over.